Each of the 23 boxes in the picture below represents a product manufactured by one of the following three companies: Alfa, Bravo and Charlie. 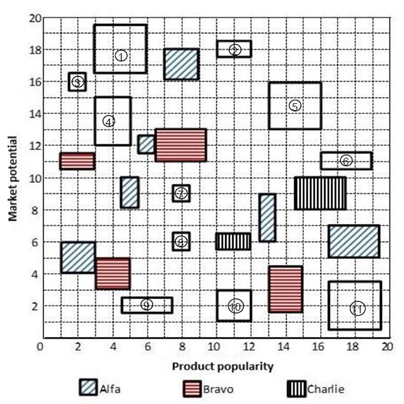 The area of a box is proportional to the revenue from the corresponding product, while its centre represents the Product popularity and Market potential scores of the product (out of 20). The shadings of some of the boxes have got erased. 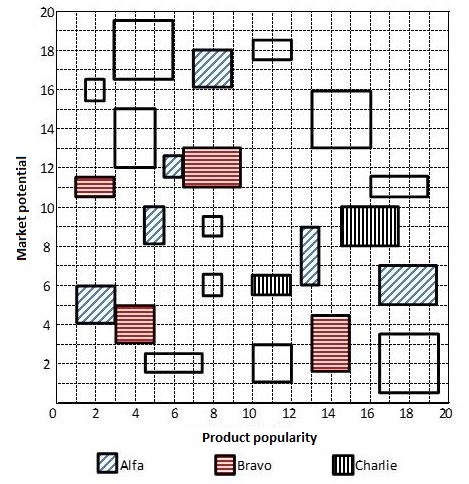 The companies classified their products into four categories based on a combination of scores (out of 20) on the two parameters – Product popularity and Market potential as given below: Promising Blockbuster Doubtful No-hope Product popularity score >10 >10 ≤10 ≤10 Market potential score >10 ≤10 >10 ≤10 The following facts are known: 1. Alfa and Bravo had the same number of products in the Blockbuster category. 2. Charlie had more products than Bravo but fewer products than Alfa in the No-hope category. 3. Each company had an equal number of products in the Promising category. 4. Charlie did not have any product in the Doubtful category, while Alfa had one product more than Bravo in this category. 5. Bravo had a higher revenue than Alfa from products in the Doubtful category. 6. Charlie had a higher revenue than Bravo from products in the Blockbuster category. 7. Bravo and Charlie had the same revenue from products in the No-hope category. 8. Alfa and Charlie had the same total revenue considering all products. Each of the 23 boxes in the picture below represents a product manufactured by one of the following three companies: Alfa, Bravo and Charlie. The area of a box is proportional to the revenue from the corresponding product, while its centre represents the Product popularity and Market potential scores of the product (out of 20). The shadings of some of the boxes have got erased. 1. Alfa and Bravo had the same number of products in the Blockbuster category. 2. Charlie had more products than Bravo but fewer products than Alfa in the No-hope category. 3. Each company had an equal number of products in the Promising category. 4. Charlie did not have any product in the Doubtful category, while Alfa had one product more than Bravo in this category. 5. Bravo had a higher revenue than Alfa from products in the Doubtful category. 6. Charlie had a higher revenue than Bravo from products in the Blockbuster category. 7. Bravo and Charlie had the same revenue from products in the No-hope category. 8. Alfa and Charlie had the same total revenue considering all products. Considering all companies' products, which product category had the highest revenue? Which of the following is the correct sequence of numbers of products Bravo had in No-hope, Doubtful, Promising and Blockbuster categories respectively? If the smallest box on the grid is equivalent to revenue of Rs.1 crore, then what approximately was the total revenue of Bravo in Rs. crore? So also the entire graph can be divided into four equal parts with the bottom left part having products in the No hope category, the bottom right part with products in the Blockbuster category, the top left part with products in the Doubtful category and the top right part with products in the promising category. As the areas is proportional to the revenue the corresponding product, products under Blockbuster category had the highest revenue. Revenue of Charlie from No-hope products – 4.
crore. Ans : 34 .